"What do I care about danger? I've sent soldiers and airmen to death against the enemy - why should I be afraid?" How do you reconcile these two quotes? Both are true. One is from a man perceived as a hero by history, another a villain. Both sent many men in uniform to their deaths. My father had a whole box of patches from World War II that he collected as a young man. We used to pull the box out every so often and sift through them all, not really knowing what they signified or how they related to each other. I'm sure it is a collection he started when his two older brothers were overseas. His brother Jack was killed in Normandy. The collection of patches had to be hard for my father, but he never said anything about it. At the same time it was probably the only artifact of his childhood that he saved and shared with us. We have the letter his mother and father received when their son was killed. It painted a story about a young man leading the charge and dying a heroic death. The most my father ever said made it clear that the letter was a fantasy, "He was very gentle man, we all knew when he went over there, that he would not last long." Uniforms, flags, patches, medals they all generate such strong feelings. In the flight sim community we can't use swastikas on aircraft skins to comply with European rules. In the Star Wars films we know the guys in gray are the bad guys. That being said, the world of caps, cuffs and collars can be confusing and complicated. At the top of the page I did an initial sketch using myself as a model for Unteroffizier Gerhardt Rupp. I realized right away that I made a mistake because I gave him a Krätzchen instead of a Schirmmütze. I was pretty sure no officer would be caught wearing the headgear of a common foot soldier. The military history enthusiasts that focus on understanding the world of uniforms are a special breed and there are many websites out there for those that want to become experts. I am not there yet, but I will point you towards three that I found helpful. The Kaiser's Bunker The most complete site with images of uniforms, markings and head gear. World War 1 - Rank Insignias of WW1 Great charts that compare the different ranks. 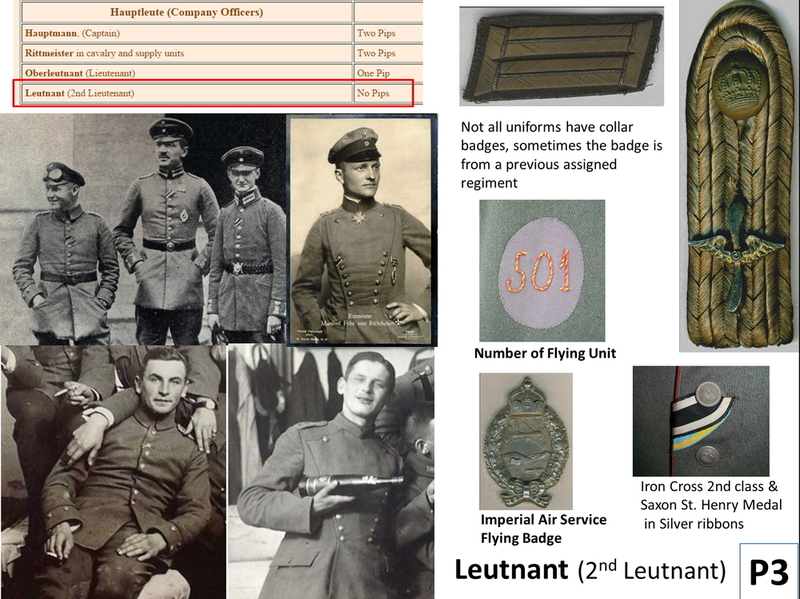 WW1 Fixed Wing Some of the best images of shoulder straps by rank. As a young man I had a leather flight cap. It was my Father's and I wore it once for Halloween when I dressed up as a World War I Flying Ace. It was in my bottom drawer forever and now it is gone. I can still remember how it felt and how the leather smelled. I wish I had it back and I knew its story.